Quickly import/export all customer / guest / administrator reviews at the click of a mouse. You can import and export review data including ratings, review title, summary and review status. Easy to import/export customer data such as customer ID and customer email address. The module includes sample CSV file for store owners. You can approve/disapprove reviews and assign reviews to customers or import the reviews as guests. The extension supports multi-stores and multi-websites. It saves time and reduces manual work. With the easy-to-install extension, you get the chance to import and export product reviews in one click. Manage important information related to product reviews such as review title, review description, review status (approved, pending or not approved) as well as ratings quickly from one platform to another. You can also import/export customer data such as customer id and customer email address. Whether you want to import reviews from registered customers or guests, the Magento 2 Import Export Product Reviews extension does all the work for you with a simple CSV file. So, do not worry about losing essential product reviews while migrating from one store to another. Order the module to solve your troubles today! 2) Go to Your Site Backend -> SYSTEM -> MageBees – Import Export Product Reviews -> Import Product Reviews. 3) Please upload your csv file and click on “Click on for Import” button. 4) After importing reviews, they will be displayed on admin -> MARKETING -> User Content -> Reviews. 1) Go to Your Site Backend -> SYSTEM -> MageBees – Import Export Product Reviews -> Export Product Reviews. 2) Select file as per your requirement then click on “Click on for Export” Button. 3) Now successfully export product reviews with the help of csv file. You can get exported csv file in /var/export/ file. This Magento 2 extension is very easy to use. You can import customer product reviews easily. No need to do laborious manual work. 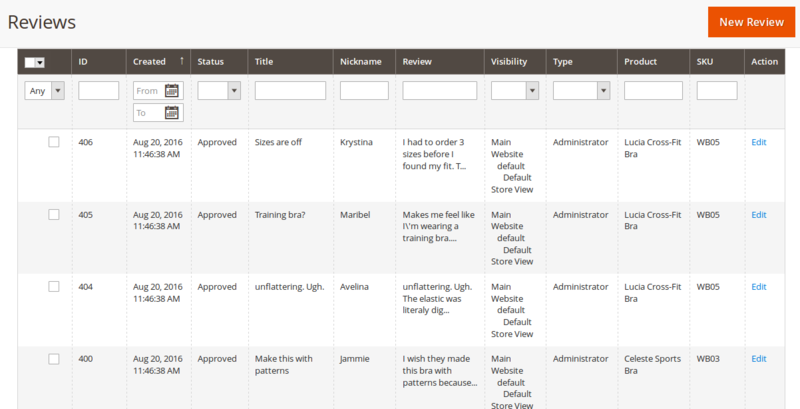 Just import product ratings and reviews with the help of a CSV file. Same goes while exporting the data. The module is very well built and does exactly as promised. Trust MageBees for their great customer support. Looking forward to buy more extensions from you. works great. and support is top notch. This ext is great. And we had issues exporting from m1 and import to m2, but the support was AMAZING. Everything works great. It enabled me to import all my valuable reviews from a non-Magento source. Cherished it. Highly Recommended to use. Very helpful, well assembled, idealize! Service great client focus. Completely fulfilled. This is first extension I purchased from Magebees. It is awesome. Importing and exporting become more simple than ever. Its works like a charm. Its save my time. Thank you. Excellent extension and great support! Fantastic extension to help you import your product reviews to Magento.Really impressed by the the support from this developer! I would highly recommend this extension! Q-1: I have installed import export product reviews extension but got following error. “There has been an error processing your request”. “ Please upgrade your database: Run bin/magento setup:upgrade ”. Q-2: I click on “Click on for import” button but got following error. “SQLSTATE: Integrity constraint violation:1452 cannot update…………………….”. Ans: This error shows that “importreviews.csv” is not properly created. It can be due to insertion of wrong store_ids in store_ids field. So please assign true store_ids in store_ids field. Ans: If you are getting time out, then increase your time out limit. For that, you have to consult your hosting guy. Q-4: I am getting “‘var/export’ directory does not exist!” error. What should I do? Ans: This error comes due to “var/export” directory does not exist or does not have write permission.